Roy Soto teaching in Guatemala. Dinner during one of the gatherings. 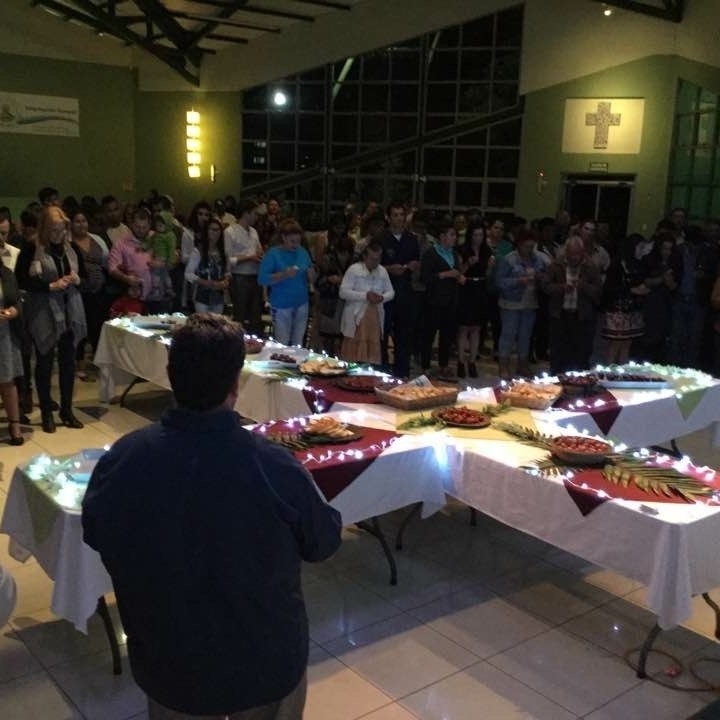 Nicaragua: Led the training of 200 pastors, leaders and couples. It was very rewarding to see the difference that our humble contribution made to each of the 35 participating churches. In addition, a group of 36 instructors from Shalom Christian Community came with me to offer intensive training to 120 leaders of children's and youth ministries. Cuba: Participated in a meeting aimed at establishing a joint strategy for the planting of churches in the Caribbean and Central America. I offered a missiological perspective of the church in the region and made proposals for the new churches to be relevant given the syncretic elements in the local cultures. I also offered a workshop to 150 pastors in the city of Santa Clara. Guatemala: Spoke to several groups of approximately 150 pastors and leaders. They were exquisite times where God confronted us about the prophetic role of the church in an environment where a high concentration of mega churches co-exists with the highest corruption and violence in the region. It was truly powerful seeing veteran pastors recognizing with tears in their eyes how limiting it has been confining the ministry of the church to its facilities. Upala, Costa Rica: Made four trips in which we trained more than 200 leaders and pastors in what is known as the poorest area of Costa Rica. Three churches decided to take on the challenge of leaving their 'salt shakers' and going to encounter the people of their communities by cleaning the cemetery, collecting garbage, opening a children's dining hall and, a home for the elderly and much more. Dominican Republic: Attended the second consultation for planting churches in the Caribbean and Central America as a rich session of planning along the lines of the first gathering in Cuba. Colloquium, 500-year anniversary of the Reformation: Shalom hosted and organized a theological discussion for 90 pastors and their leaders to reflect on the reforms that the church needs for these times. The event was a challenging space where we were committed to make the relevant changes in the life of the church starting with its leaders. God allowed me to travel to several countries in which I was able to see and savor the diversity of the hope of the message of the kingdom of God transforming realities of pain and need, bringing about new life, helping churches to become relevant and reaching communities with the ‘salt and the light’ of the gospel. Since at least 700 pastors and leaders participated in these equipping gatherings last year, Roy is considering developing a training program in the Shalom Christian Community facilities where people could go for three months and be equipped in a more systematic way. Thank you so much for participating in these mission efforts that are making tangible differences in Christ’s name in so many Latin American locations. Read more about Shalom Teaching Ministry HERE. The Outreach Foundation is seeking $7,000 to assist with travel, materials and food for four one-week teaching missions.